You are rocking those bell bottoms! You look fabulous! I love the bell bottoms!! Such a refreshing change from the skinnies over here, over there, everywhere! Love, love, love the bell bottoms! You look great! Those flare jeans are awesome – you can totally pull them off! The blanket scarf is pretty golden. I love how you styled it very simply with a red bag and black shirt. So chic! This looks so comfy and cute! Love your bell bottoms!! Rocking those bell bottoms! And I love the purse! Yay for flares!! Love how you styled yours! That scarf is amazing! I’m obsessed with these jeans- they’re perfect on you! Wow, I think that is the biggest scarf I’ve ever seen !!! So nice to see bell bottoms again. You are rocking those jeans! So retro and cool! I love that scarf too! OMG I love your jeans! These are the widest bellbottoms I’ve ever seen! You are so amazing, love the hair and the jeans! Oh wow, these bell bottoms rock. I’m glad they’re back in style because they were always stylish to me. 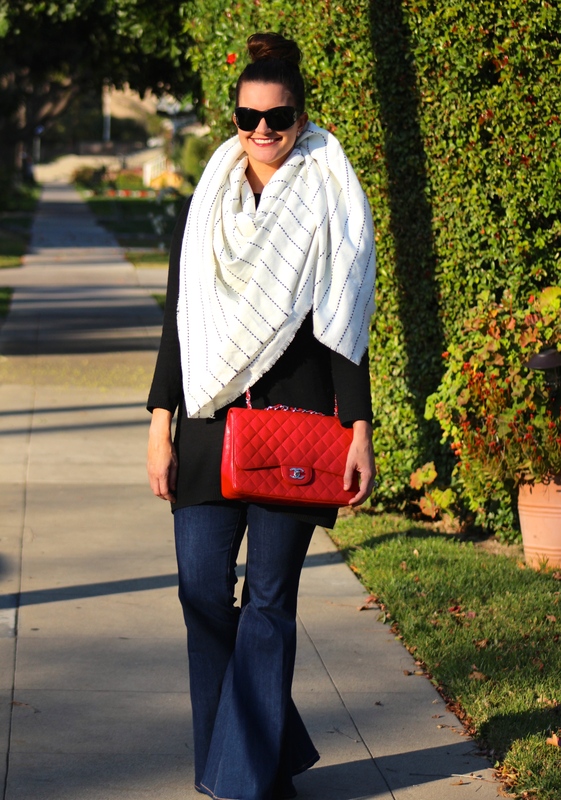 You look so effortlessly chic–the scarf and those awesome pants just go perfectly together. Love it. Gorgeous! I love the black and white pinstripe scarf! These jeans are fierce! As are you in them! Fabulous babe! 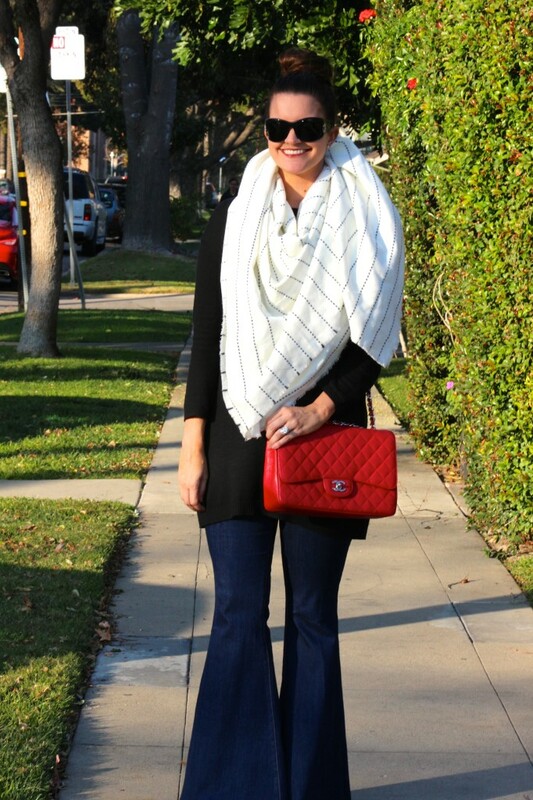 I’m sure your bell bottoms look great and so does your blanket scarf, but I’m too busy drooling over you baaaaaag!!! 😉 Have a great weekend! What a great bag & scarf!!! 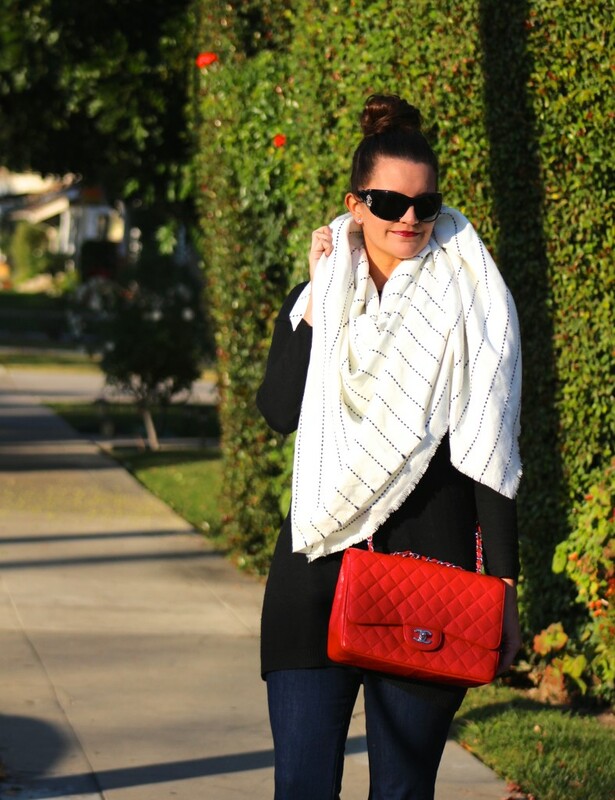 Love the oversized scarf, looking stunning! 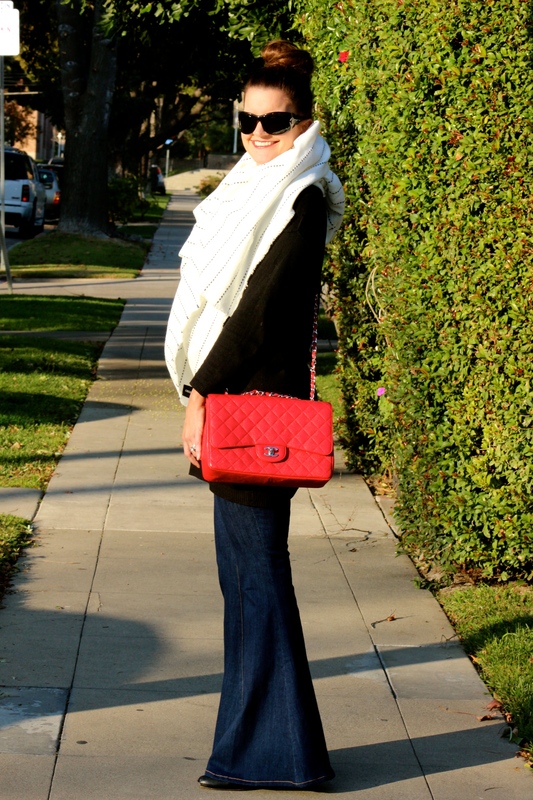 Love the oversized scarf and that Chanel bag is perfect. I’m glad I’m not the only one who loves flared jeans! I am so glad these jeans are back! I used to live in them last time they were in trend. Awhh your jeans! Perfect! Looks so good on you <3 Totally love this outfit! I LOVE bell bottoms! And the colors is great — fabulous! These bell bottoms are just way too fun!!! I love how tall these jeans look on you.